Because I Can Tri is moving!! 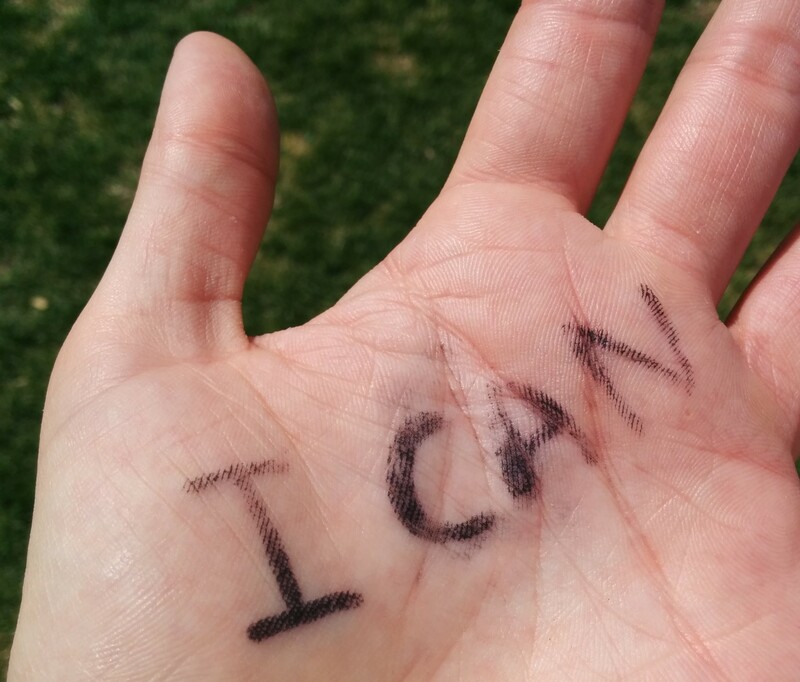 Because I can Tri is excited to be moving to our own custom domain http://www.becauseicantri.com Come check it out! It’s the end of the season, all the hype is over. Everything we have been training for all year has come and gone and it’s common for athletes to fall into a bit of a ‘funk’ at this time of year. Suddenly our goals are all complete (for better or worse) and we don’t know what to look forward to anymore. I thought it wouldn’t happen to me. I spent almost a year working up to Ironman, every spare minute seemed to be devoted to training and my life operated on a schedule. 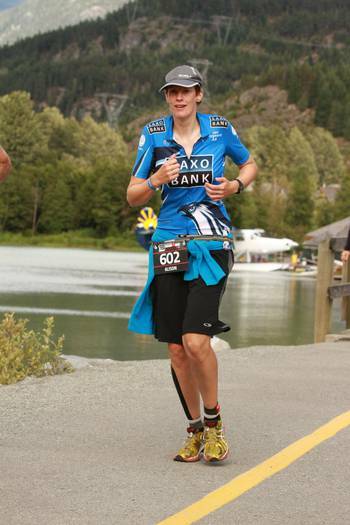 This ended with me crossing the finish line at Ironman Canada, and whilst I was ecstatic at the achievement, there was an air of anti-climax to the whole thing. How do you top Ironman? Another Ironman? A harder one? Something longer? Or faster? As I cast around for my next challenge, my training foundered. Here are the tips that work for me when motivation deserts me. It’s a vicious cycle. You miss a workout, you get stressed about missing a workout, so you miss more, this weeks a bust already right? You’ll do better next week. Now, whilst I don’t think we should just turn into couch potatoes, it is OK to take a short break, especially if you have just completed a major race. In fact, it’s something you probably should do! Try some fun workouts, do something different. 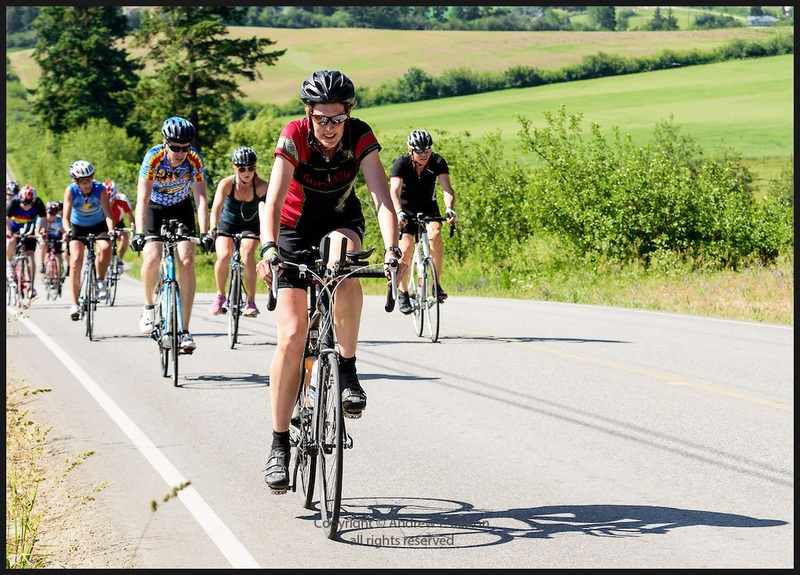 Many cross training activities will benefit regular training and it can offer a great opportunity to spend time with friends and family (who can sometimes get a little neglected during peak training sessions). 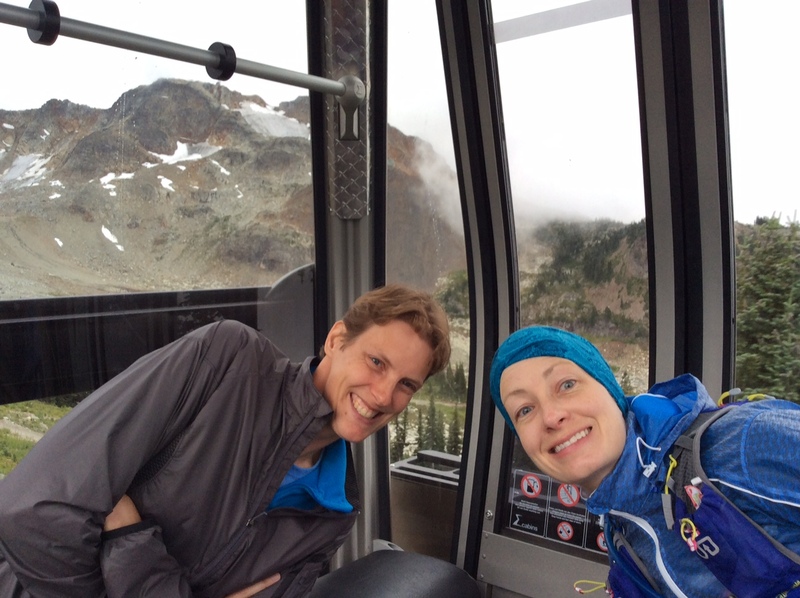 Maybe a mountain bike ride or hike, cross country skiing, paddleboarding or a class at the Y. Doing something is better than nothing. Remember why you like to train for your sport and what makes it fun. Everything is better with friends. Having a friend waiting, makes me far more likely to show up, and usually makes the workout more enjoyable as well. Can’t find a friend? Go make some new ones. Join a club or sign up for a series of classes. Scheduling the next season can be a big motivator, and always lights a spark of excitement in me. It doesn’t have to be another monster like Ironman. Maybe you want to get stronger or faster and that’s a perfectly good goal. Maybe you aren’t there yet. Maybe your current goal is just to exercise every day. Whatever it is, write it down and start working towards it. Sometimes just getting out of the door is the biggest barrier. In this case, getting ready and forcing yourself out of the door can be the best strategy. Promise yourself that if after five minutes you still aren’t feeling it, you can stop. Often once you start, you realise it’s not so bad after all. The five year old in me still loves the visual and tactile sticker chart. 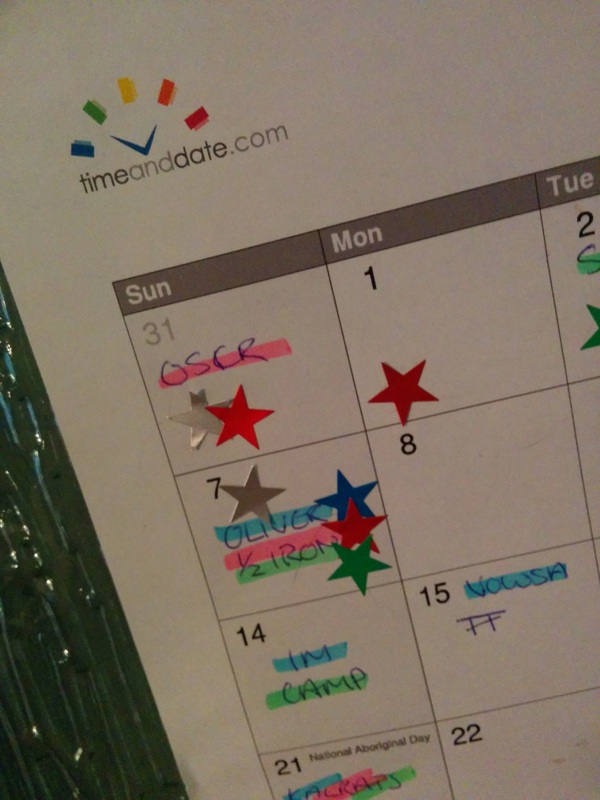 It allows me to see progress at a glance – a chart full of stars always makes me smile. There are of course numerous online tools for this as well. At least one has to be a yes! Most importantly, equating a missed workout to a major failure in life is a mistake. Motivation ebbs and flows and accepting that will go a long way to fixing it. What are your tricks for staying motivated and accountable? We stepped into the cold water and stood looking out over the lake in silence. Presently, the National Anthem began playing over the loud speakers. As we listened, the rain began to fall. And that was to set the tone for the rest of the day. 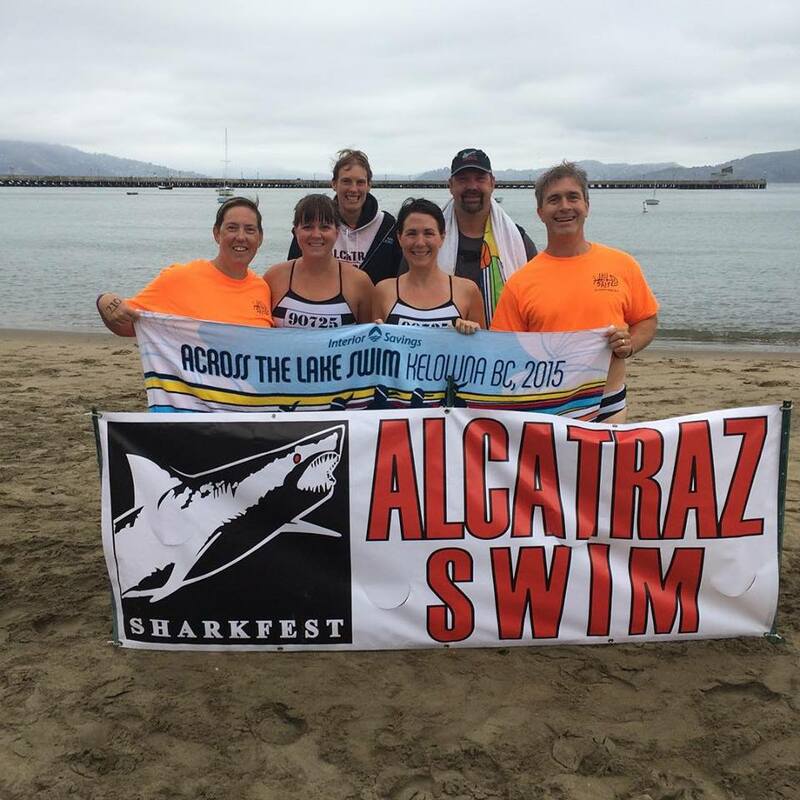 The swim was a double loop, and the course was crowded. I tried to focus on keeping a consistent stroke. It felt like forever, but at last I made my final turn towards the beach and T1. I was being hit by waves coming at me from the side, I couldn’t figure out how I hadn’t noticed this choppiness before. Confused, I battled my way to the beach. (Later, spectators would confirm that the wind did indeed kick up, just before I exited the water). As I ran out of the water, I started to undo my wetsuit, the competitive sprinter in me taking over for a moment. Of course, the few seconds I was saving here would be a drop in the ocean compared to the 15 hours I expected to spend out on the course that day, but ‘old habits dies hard’. 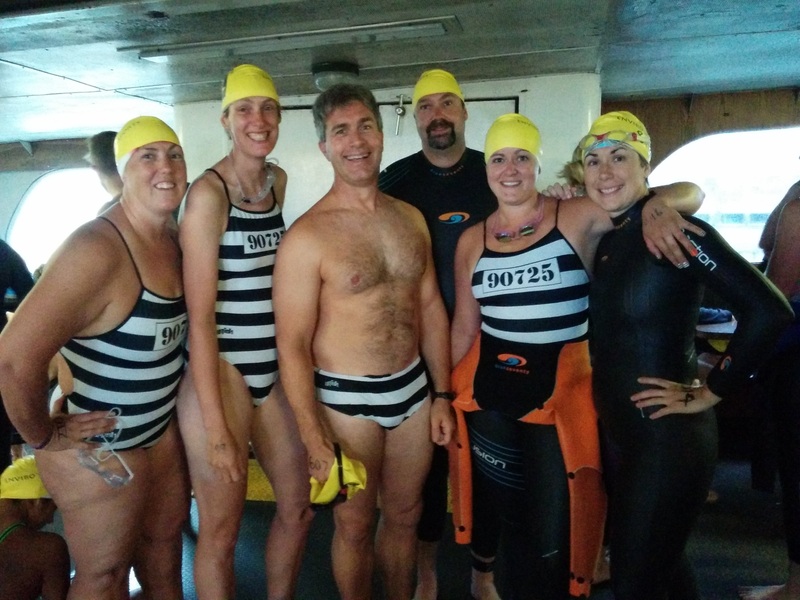 I had never been at a race with wetsuit strippers before and I didn’t know what I was missing! I sat on the ground and a second later they had yanked my wetsuit off and handed it back to me. Inside the change tent, I found an empty spot, tipped out my bag and hurriedly got changed. 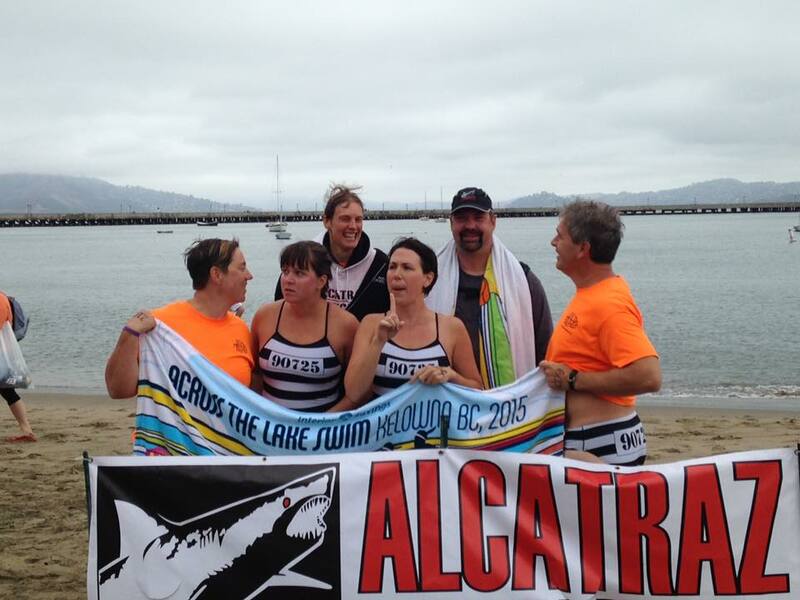 I had opted to wear my bathing suit on the swim, and then change completely in T1. A helpful volunteer held out the late addition sweater and asked if I wanted to wear it, I gave it one more second of consideration and decided that yes, I would. I slipped it on, followed it with the waterproof jacket and headed out to my bike. I jogged past the sunscreen station, (not doing a roaring trade given the weather) and headed to the bike racks. I almost ran right past my bike and had to crawl under the rack to get to it. I left T1 laughing to myself. The rain was really heavy as I mounted my bike and headed off towards Callaghan. I was passing a lot of people early on, it was almost impossible, with the bulk of riders to keep out of the draft zones, I just concentrated on making constant forward progress. I was concerned I might be going too fast, but a check of my heart rate confirmed that I was fine. I was cold, and very glad that I had worn the sweater after all. This part of the course is a steep hill (and the location for the Olympic ski jumps, if confirmation of the gradient were required). I settled into my easiest gear and started the long grind uphill. Part way up, during a gear change, my chain came off and jammed my pedals. I wobbled alarmingly for a second as I desperately tried to unclip a foot and stand. This would not be a good time to have my first clipped in fall! Thankfully, just in the nick of time, I was able to put my foot down, climb off my bike and fix the situation. Crisis averted. That would have been embarrassing! Now I just had to get going again on this steep hill. A couple of false starts later and I was again on the move, albeit slowly. The remainder of the climb was uneventful and I reached the turnaround at the top feeling good. I had counted on taking advantage of a good dose of ‘free’ speed on the downhill, however, the rain had put paid to that idea. The water ran in rivulets across the road and the fabric of my jacket snapped in the wind, making the descent quite terrifying. The course then rejoined the highway and I continued on the long descent towards Pemberton. The monotony was broken by regular aid stations stocking water, Gatorade, energy gels and bananas. My nutrition plan called for me refilling my water and also eating bananas. Volunteers were lined up along the road with various offerings. I slowed a little and reached out to grab a water bottle as I rode by. Success. My knees were aching – which I put down to the temperature, which I later found out was under 10 degrees Celsius. On top of that, all of the muscles in my neck and shoulders were screaming, probably also due to my tensing up in the cold. I finally made it to the Pemberton turn. 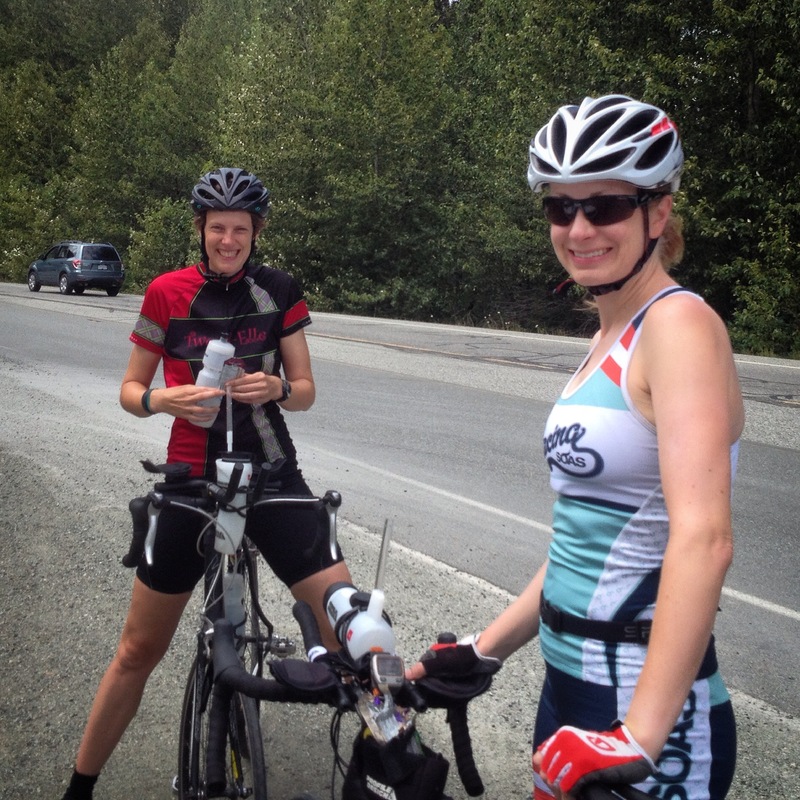 This meant a 40km flat out and back before heading back up that long hill to Whistler. Just as we started the out and back, we passed our special needs bags. I made a snap decision that I would not stop. I hadn’t had a flat, so I didn’t need the spare tube, and I was feeling pretty good and thought I could manage without the extra nutrition items – even my beloved Ribena. I really wanted to make up some time here, but more importantly at that moment I really wanted to use the bathroom! At the next aid station (which typically took forever to arrive) I stopped my bike and joined the queue (of course). I took the opportunity to stretch a little, which elicited a very satisfying crack from my neck. A few minutes later, I was on my way again. The ride now seemed to be going quite well and I was enjoying it. Until, that is, I reached the turnaround. “That’s why it felt so good!” I thought to myself, as I pedalled against the headwind on the return journey. I was feeling very sleepy by this time, struggling to keep my eyes open. Luckily I had experienced this in Oliver, had had come to Whistler prepared, so now I ripped open the tiny bag that I had stashed on my bike which contained some Tylenol and a caffeine pill. Soon, I began to feel better, and as I left Pemberton behind, I finally managed to snag a banana from the aid station. 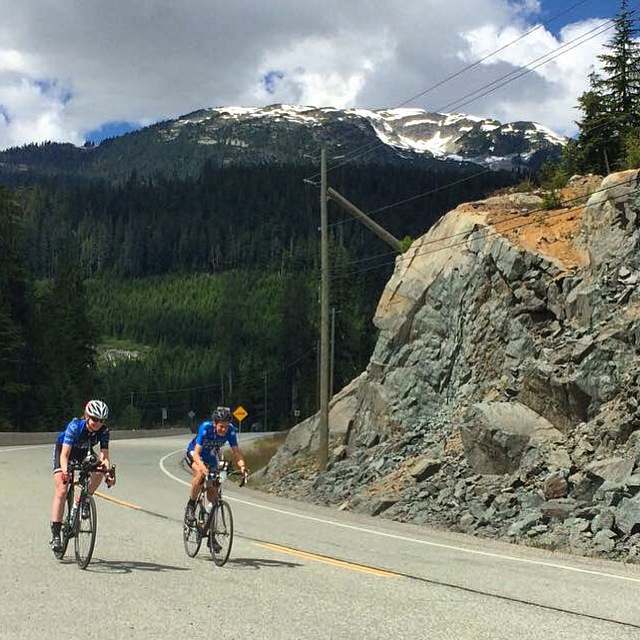 Now, I just had to conquer that 30km climb back to Whistler (and then the little matter of a marathon, but let’s not think about that right now). The climb was long and slow, but I already knew I could do it, and I could see looking at my watch that I would be well within the cut-off. The climb felt like forever, finally, to my great relief, I saw the sign for the village and the course veered off to the side. I had tears in my eyes when I finally saw the arch to T2. The bike cut-off had been my biggest fear throughout the year of training and this moment was arguably the biggest achievement of the day. As I entered the change tent, Kay hailed me. I was briefly confused, as I expected her to be further ahead. Unfortunately, her race was not going to plan, mostly owing to the cold. I will forever be grateful for her enthusiastic encouragement, particularly given the difficulties she was facing. Another wonderful volunteer came to help me change in T2. Unfortunately, though she was very patient and helpful, my mind was not in the right place to receive help. She was handing me things from my bag, but everything was in the wrong order. I couldn’t quite compute this change. Unfortunately, in the end, I ended up leaving transition without my water bottle. The first 5km of the run is a loop around Lost Lake, and it started very well. I was surprised how tight all of my muscles felt, probably a result of being tense on the bike. Even my biceps ached. Around 10km, I switched to a run-walk strategy. 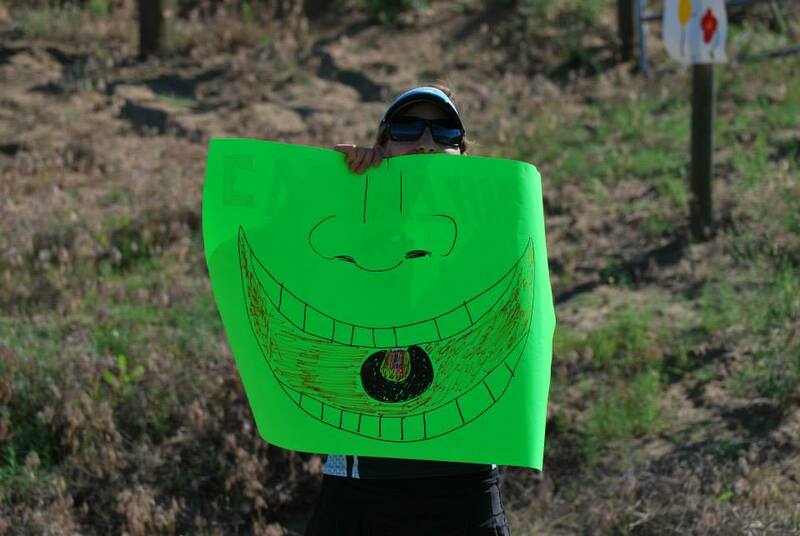 I ran between the aid stations, eating what I felt like from the selections available. Then, it happened. My ankle started hurting. Ironically, not the ankle that less than a year ago had healed from a stress fracture. My left ankle had never given me trouble before, but now there was a stabbing pain. If only I had some Tylenol. But it had been carefully stashed in the pocket of my water bottle. The same water bottle that I had accidentally left in T2. I kept walking, but I was barely holding things together. Thank goodness, no-one was nice to me or I might have burst into tears. I couldn’t understand it. 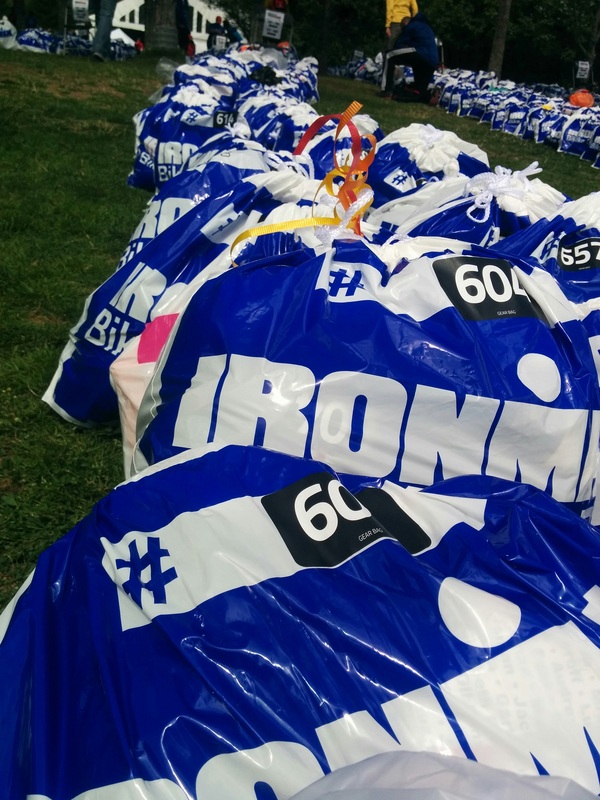 Yes, this was Ironman, I suppose I could be forgiven for being a bit emotional, but really? This just didn’t happen to me! I marched on. I needed to keep moving as fast as I could. The kilometres ticked by so slowly. It seemed like an eternity before I reached the special needs bags and the long awaited painkillers. I stopped this time and drank the emergency bottle of Ribena. I closed my eyes. I could hear the voice of the announcer calling in finishers nearby. I felt so jealous of those athletes, already done for the day. I was at about 25km here, so there were another 17 to go. I had to keep moving – away from the finish. I knew I could finish now, all I had to do was keep putting one foot in front of the other. Actually I felt quite good, considering. One foot in front of the other. That’s what I did for about the next three hours. Aid station to aid station. Kilometre marker to kilometre marker. Never in my life have kilometre markers seemed so far apart. There was a blister on my foot now, I was sure. I didn’t look, how would that have helped? My ankle actually felt quite a bit better now, and I no longer felt like bursting into tears, so things were looking up. I was hugely disappointed though as I realised that I could not make my goal of finishing in less than 15 hours. I really hadn’t been that invested in doing so before the race. It was more of a case of “wouldn’t it be amazing if I could”. As the day had gone on, however, it had become clear that I was capable of achieving that, though perhaps on a different day. The sign said 5km to go. I kept walking through the darkness. I was striding along with another girl (whose name I don’t recall). We passed a sign saying 41km. “1km to go” she commented. 1.2km, I corrected. We laughed about the 0.2km being our undoing. Finally, the finish chute came into sight…and the course lead us on a small (was that 0.2km?) loop away into the village! Oh the cruelty! Now we were heading for the finish. The music was blaring, the lights were so bright. Suddenly this was it. The moment I had been training for all year…and waiting for all day! “Alison, You Arrrrrrrre an IRONMAN! !” rang through the speakers. I almost couldn’t believe it. Someone hung a medal around my neck and a volunteer steered me to pick up my finisher t-shirt and cap and pose for a picture. Then, like a mirage, Kay appeared… with a slice of pizza! Having completed her own race, she had waited for me at the finish line. We went to collect my bike and gear bags; I ate the pizza and I thought it was the best I’ve ever tasted in my life! As we walked back to the hotel I was in a daze. 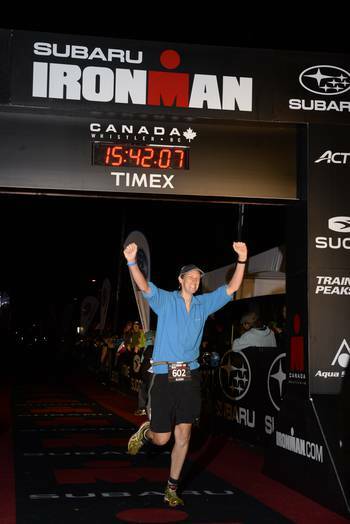 My finishing time of 15:42 had been a little disappointing…on the other hand, I had just completed an Ironman. I wasn’t quite sure how to feel. When I got back, I checked my phone and was truly humbled to see the number of messages from friends. So many of them had been live tracking my progress online throughout the day and had already sent their congratulations. I’m at the end of my year long journey, or could that be the start of something new? I used to say I would never attempt an Ironman. Then I said I’d only ever do one. 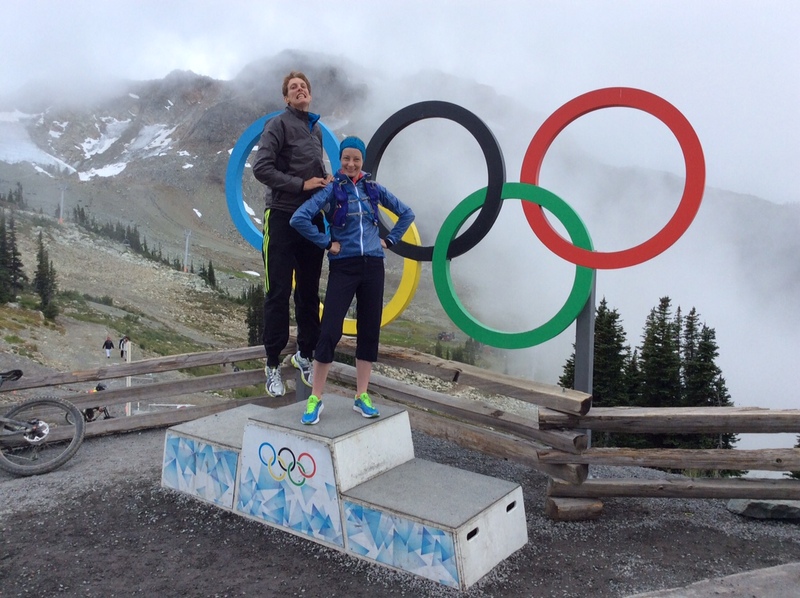 During the marathon in Whistler, I was sure I would never do this again. But I know I can do better…next time? 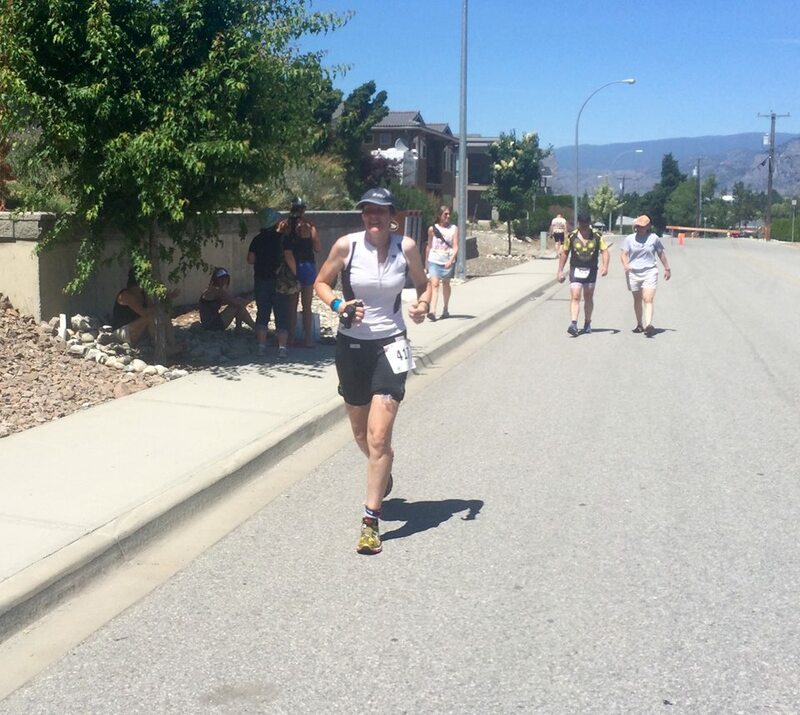 As June came around and my mileage was increasing in preparation for Ironman Canada, two events were scheduled a week apart. Mt first century ride (100km) was the Guardian Century Ride last September. Back then, 100km was further than I had ever ridden and the ride was a bit of a struggle for me. I knew that my fitness had improved substantially since then, so my hope was that this would be a good confidence booster. 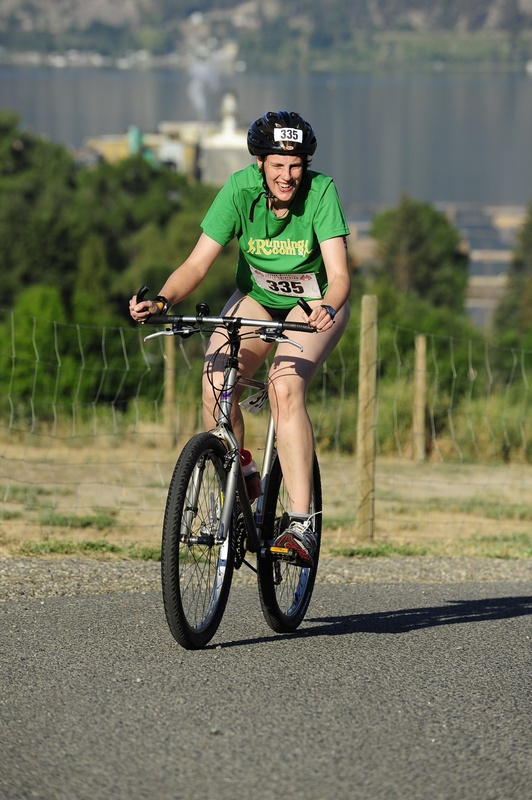 I also intended to use it as a test, a trial run for the bike portion of the Oliver Half Iron the following week. I woke up to a hot, sunny day and with some friends, drove out to Armstrong, where the ride started and ended. I got everything set up for my nutrition plan (1 gel every 30 minutes) and lots of water. Then after a brief speech we rolled out…. Straight onto a hill! Everyone was passing me, which by now you might think I should be used to, and I guess I am, but it never really stops being disappointing. There were still enough people around me though, as I pedaled onward. The scenery was beautiful and the range of people doing the ride inspiring. Soon enough I reached the first aid station – about 25km in. This was also the turnaround point for those riders signed up for the shorter 56km event. Trying not to think about how nice it would be to just join the shorter ride, I hopped off my bike to refill my water bottles…which weren’t empty. Probably need to drink a bit more then. I made sure not to stop long and continued on my way. It was much quieter now, since many of the riders had turned around. The route took us out through deserted farmland with rolling hills. I took the opportunity to test out my new aero bars on the empty roads, which kept me amused for some time. Eventually, we entered the not so bustling metropolis of Salmon Arm. It contained a hill that by all accounts (and apparently exaggeration was unnecessary) was so big and steep as to rival Mt Everest. Atop this fabled hill, sat aid station 2. As the hill in question loomed before me, with a little trepidation, I dropped into my lowest gear and began to slowly grind upwards. Suddenly, I was at the top. Am I allowed to say that the hill was an anticlimax? That’s not to say it was easy by any means, just not as hard as I had been lead to believe. That over, I stopped at the oasis that was aid station 2 and refilled my water bottles before getting underway again. Everything seemed to be going well until suddenly I began to feel quite sick. 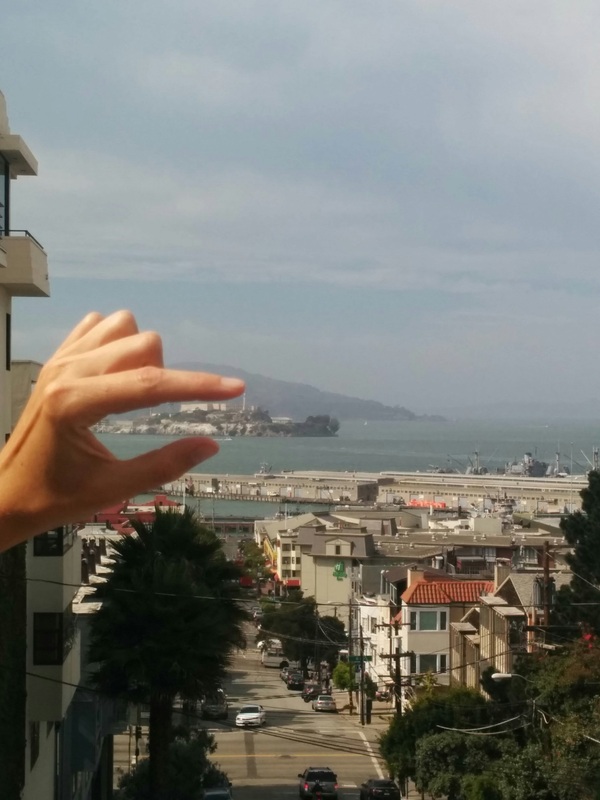 My legs lost power – I didn’t know what to do. I settled for eating another gel and willed my legs to keep pedaling. Another rider informed me that the final 10km were largely downhill and that we were almost at that point. I hoped he was correct. It seemed like forever, but finally we began to descend. I began to feel better immediately as I sensed the nearing of the finish. My GPS indicated four hours and eight minutes, far faster than I had dared to hope for, and definitely a good sign for the upcoming Half Iron. I felt strong, my confidence high….and hungry! 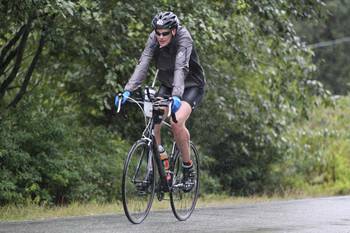 Two months out from Ironman is a good time to test a long distance race. This was to be my longest race to date, and a chance to test the logistics that would be key at Ironman. The race in question was a couple of hours away, luckily, my wonderful friend Lenora offered me a ride, accommodation plus her excellent company for the weekend. Thanks Lenora I couldn’t have done it without you! Check in for this race was the day before so we arrived early in Oliver, picked up our packages and racked our bikes in transition. Also in attendance at the race was Coach Luke of Balance point Racing. He offered some valuable tips on racing in the heat and helped me install a new water bottle to the aero bars on my bike. The next morning we were up early to head to the start. I finished setting up my transition and waited nervously. 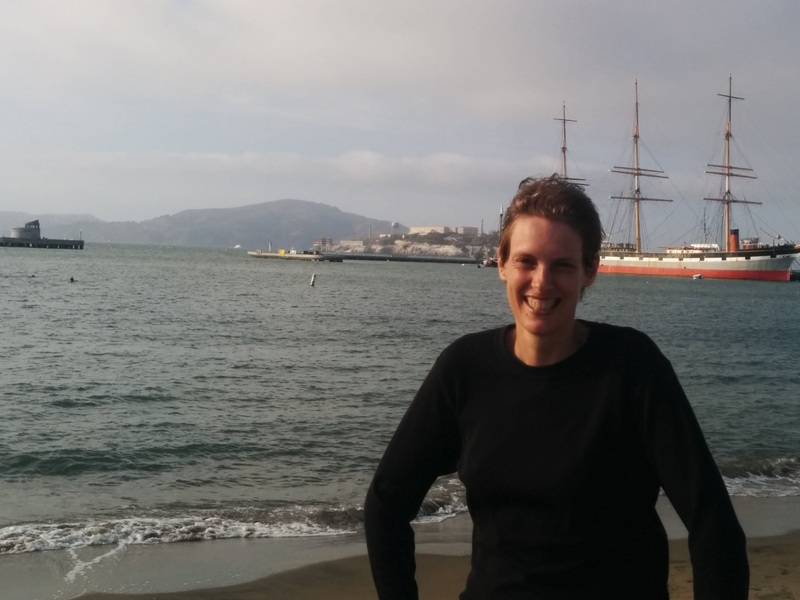 I was unsure of how I would handle the distance and whether I could beat the cutoff times. It was already warm and it promised to be a very hot day – another thing to worry about. After a short delay, we lined up for the start. The water temperature was only just wetsuit legal, not that this fact mattered hugely to me as a non-wetsuit owner. I was one of only a few ‘naked’ swimmers. Thanks to the person who offered to loan me a wetsuit, I hope I didn’t seem too rude in declining! I hadn’t trained in a wetsuit, so adding one at this late stage didn’t seem like a good plan. Right from the start, this race was uncomfortable. I was struggling to breathe smoothly during the 2km swim, and strangely for me, I was cold! Predictably, most people passed me in the water, and I definitely had no trouble locating my bike when I got to T1 – it was still there, patiently waiting for me on it’s own. The bike course in Oliver is rather pretty for the most part; a double loop that has only one serious climb. I was feeling sick right from the start. I tried to keep drinking and eating (following the same plan as I had used the week before in Armstrong); as well as swallowing salt capsules at regular intervals. I kept riding, but the nausea didn’t go away. The first 30km or so weren’t so bad, riding past vineyards and admiring the views. Then we turned onto the highway. Functional if not creative naming from the city of Oliver. I kept riding, the highway not quite so pleasing, but still surrounded by vineyards, and a rather mean rumble strip a foot to my left. After what seemed like forever, Road 6 appeared all of a sudden and we turned off in to a more rural road (read: bumpy). A friend passed me (Yes, he was a full lap ahead of me, underscoring my feelings of inadequacy). He helpfully pointed out a pothole as he passed it, which I certainly would have hit as my focus was beginning to drift. I had been concerned that this could be a problem in longer races – and I still had another lap to go. The second lap was more challenging than the first. I still felt sick and now I was tired as well. With around 20km to go I could barely keep my eyes open. My mind was wandering all over the pace as I tried to focus. I tried to work out what was wrong. Was I not drinking enough? Eating enough? Taking enough salt? Could I mitigate this problem? I tried to drink more, but I was already feeling sick and it felt like I was drinking all the time anyway, how could I drink more? To make matters worse, this was all happening in slow motion whilst I was trying to maintain a passable speed on the bike course. I pedalled onward and finally reached transition. An official informed me that I had indeed made the cut-off, so on to the run it was. I headed out onto the run course. But not after a 2km swim and a 84km bike and it was hot, so hot, over 35 degrees, and the course had little shade. I tried to run, but had no energy. I didn’t know what to do…except keep plodding forward. I decided that if I wasn’t going to quit (and I wasn’t! ), then I had to throw all of my resources at this problem. 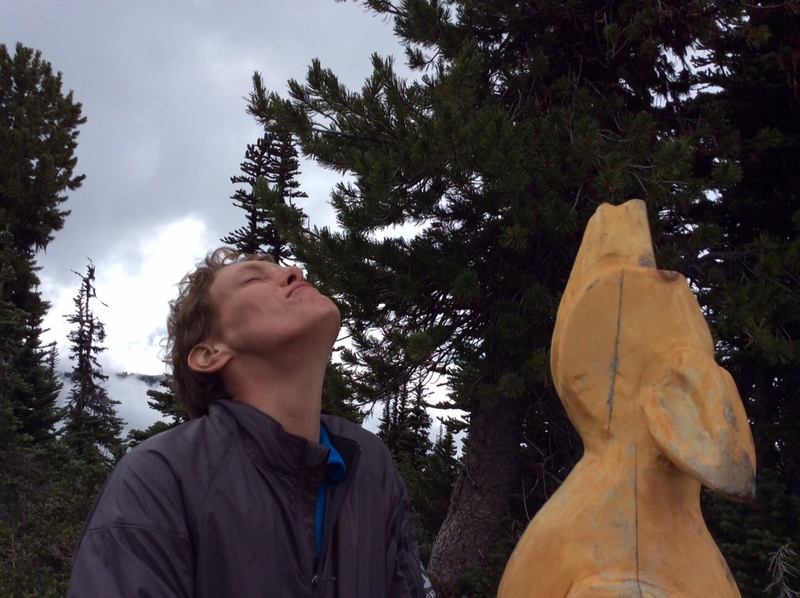 I began to focus on getting from one aid station to the next. I became *that* person at the buffet, pillaging each aid station. I ate, I drank water and Gatorade, I took salt tablets and used ice to try to cool myself. Normally I prefer to be a little more analytical in my problem solving, but I was short on time and facing a very long and very miserable 21.1km, so the shotgun approach was my only option and still I trudged on, not feeling any better. At the far end of the run course, the organiser had set up a sprinkler. As I stepped into the spray, the cold took my breath away. I stood for a moment, letting the cold water run over me. My head clearer, I ran on slowly, I was able to keep running, things were looking up. Aid station: Gatorade, water, ice salt, gel, run on. Soon though, I started to overheat again (damn you quick drying fabrics! ), then like a mirage, a woman appeared, holding a hose and spraying passing athletes. I continued running from sprinkler to sprinkler, from aid station to aid station, I dared not look at my watch lest it told me I would miss the cut-off despite all of my best efforts. I was able to run the majority of the second lap (hooray for the shotgun approach and the wonderful citizens of Oliver and their hosepipes!). As I finally crossed the line in 8:01:15 (seriously, it couldn’t have been just under 8 hours!?) all I wanted to do was curl up and sleep. The run portion of the race had taken me 3:18, much slower than my plan and a huge disappointment. I was happy to have finished (or was that relieved), but the race definitely hadn’t been a good one for me. Luckily, I have some great friends to bring everything into perspective. As they say, what doesn’t kill you makes you stronger and a few days later, I was able to see this as the achievement it was and the learning experience it could be. A triumph over adversity and a successful comeback on the run. I had gathered vital information that I could use to tweak my race plan for the future, hopefully slightly more analytically now. I’m not sure what originally made me think that triathlon would be a good thing to do. 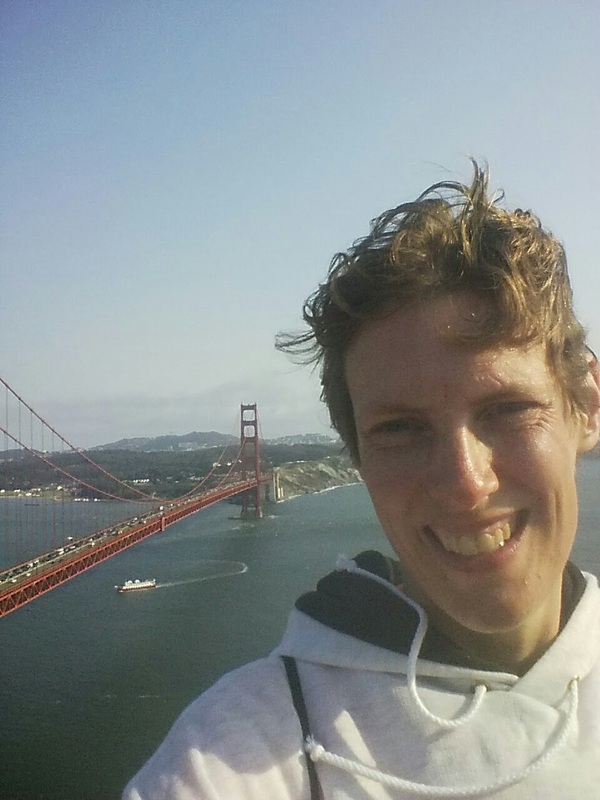 I had recently attempted to return to running and was having the usual recurring injuries and problems, so I was looking for something different. 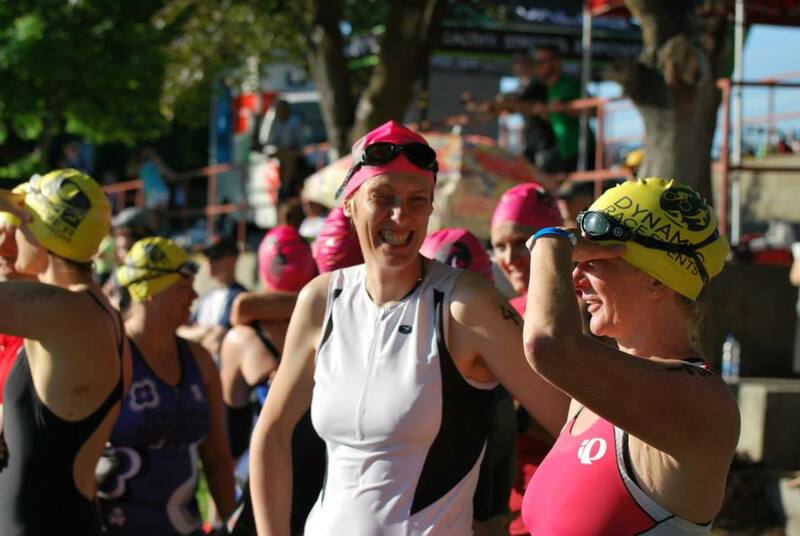 Triathlon: Swim – Bike – Run. I can do those three things, maybe I can do a triathlon. I didn’t jump right in. That first year I just volunteered. A few hours of standing and cheering, watching people achieving their own goals, convinced me that I ought to be able to do this too. The seed was sown. 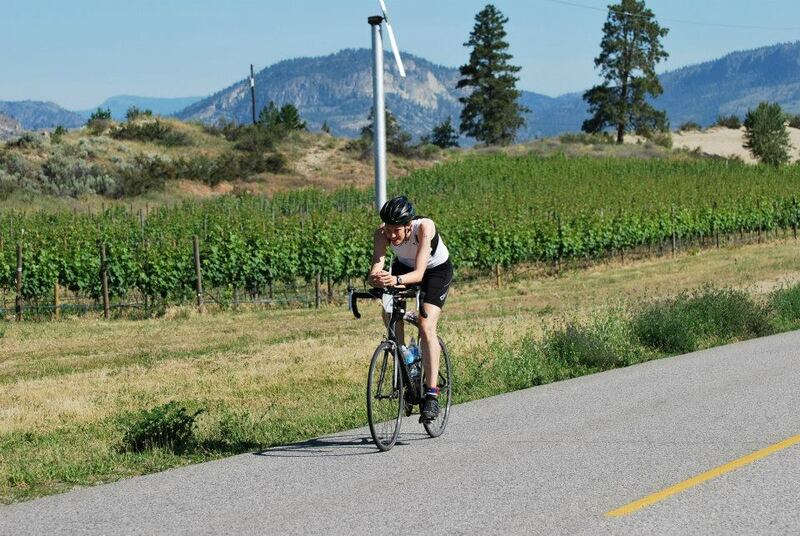 The following year I signed up for a training clinic advertised on the Kelowna Apple Triathlon website. As I walked into the first session I was absolutely terrified, it really took all of my willpower not to turn and run crying in the other direction! Everyone seemed to be so fit and confident…and then there was me. I am so glad I stuck it out though, despite being possibly one of the least talented athletes Chris has ever worked with, and certainly the slowest in this group by far, I made some friends that I still train with today. 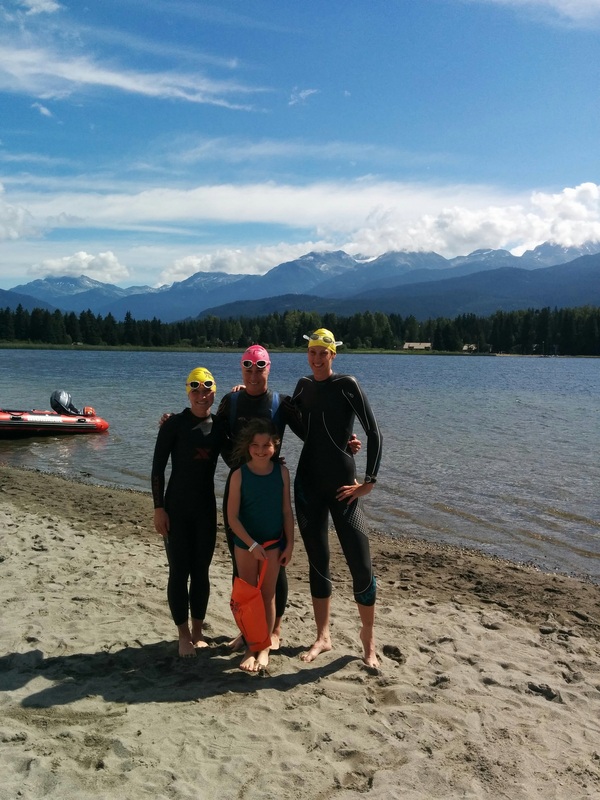 Over those eight weeks I swam in the lake for the first time, and the Knox mountain hill, after a few abortive attempts, went from absolutely impossible to “I might just make it”. I agonized and discussed all of the details, what to do when, what to wear and how to put the whole thing together. It seemed like I was capable of more than I had given myself credit for. As the event drew near I took a deep breath and, with the encouragement of my new found friends, instead of signing up for the try-a-tri event as I had timidly indicated on day one, I registered for the Sprint distance. There was no backing out now! The day before the race we met as a group to check out the course, and went for a swim in the lake, my previous swims had all been at the nice sandy Gyro swim loop where the bottom was mostly visible at all times, Tugboat Bay is not like that, it’s deep and full of weeds and once again I was terrified – what had I done? Could I back out? Luckily those friends talked me down, and I’m so glad that they did. Race day arrived and I woke up early and headed to the event with plenty of time. I had my race number written on my arm and legs and headed into transition. I looked around at the rows of beautiful and expensive bikes, then looked at my trusty mountain bike, I felt so out of place. But I needn’t have done, everyone was very friendly. 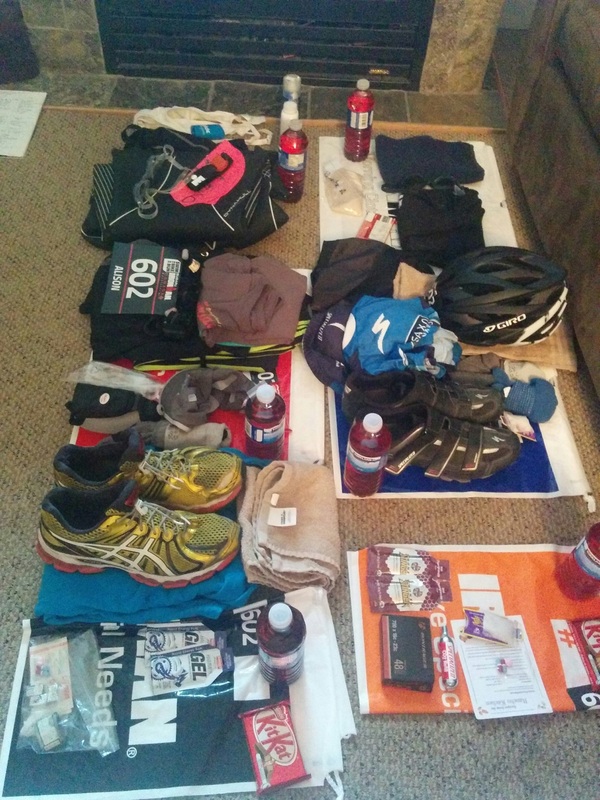 I set up my tiny transition area, checked it again and again, and headed down to the start. Lining up at the start I felt surprisingly relaxed, having already made a decision to just have fun and not worry about how fast or slow I was going. Suddenly we were off. 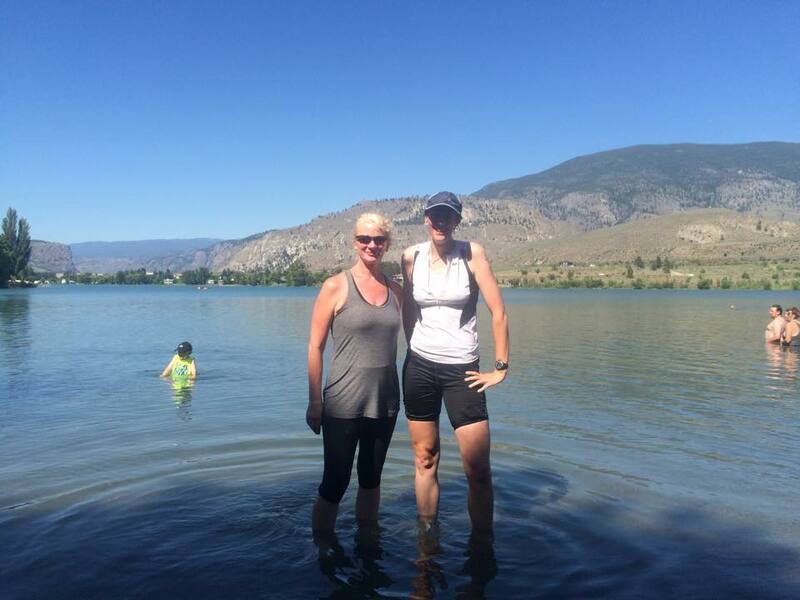 I ran into the lake and started swimming, focusing on my stroke and maintaining a consistent pace. Eventually, the beach loomed and I jogged out of the water and into transition. Part one done! I pulled on my shoes, grabbed my bike and headed out of the transition area. A couple of weeks ago I had attempted to ride the bike course (just to make sure) and had found the first hill to be very hard, almost impossible, but today I rode up it slowly but steadily. I can’t tell you how glad I was to get to the top! Two laps later, and I was on the run…I was running! I didn’t manage to run the entire 5km, but it didn’t matter, when I saw the finish line coming into view, the feeling of accomplishment was amazing. 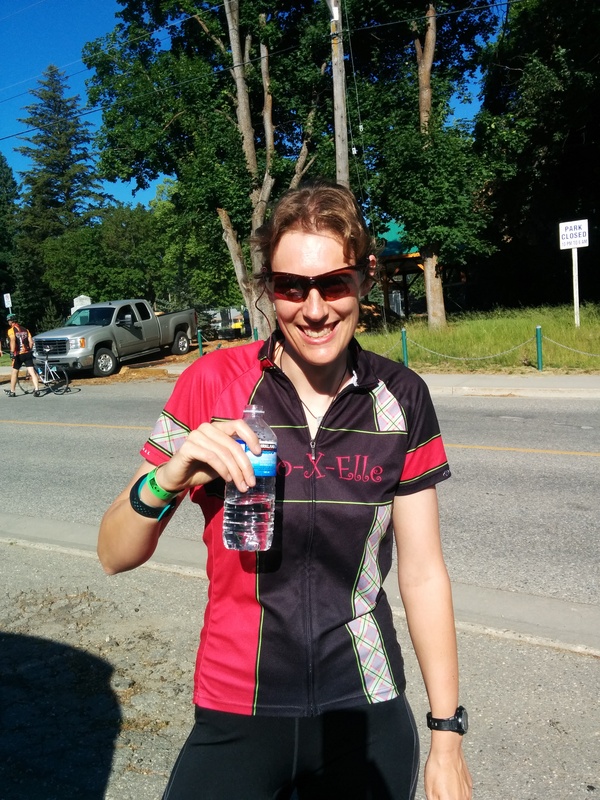 Since that day in 2012, I’ve completed 12 more triathlons and even signed up for Ironman! 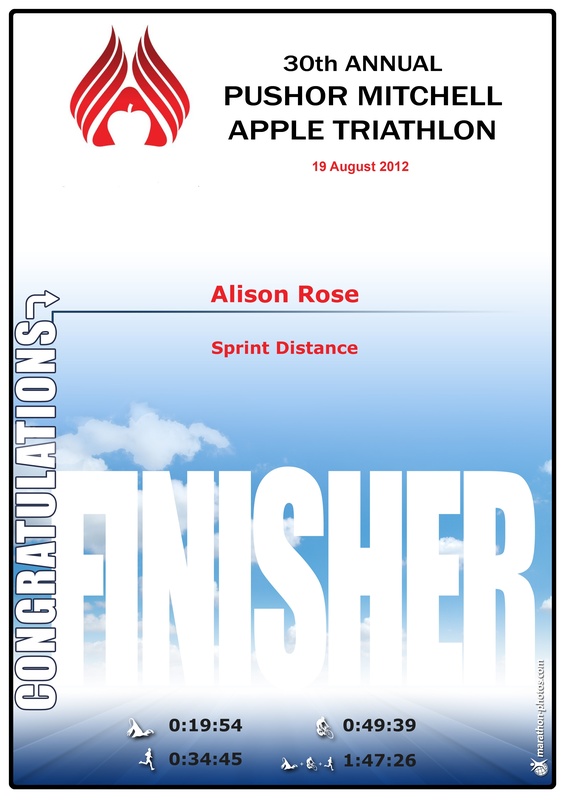 Turns out I love triathlon and I’m improving all the time.